Levi Wielenga, a volunteer and Farm Rescue Foundation board member from Sioux City, Iowa, drives a tractor pulling a 60-foot air seeder through Lincoln and Loren Shuck's field near Fairpoint. The Shucks lost 623 head of cattle during the October blizzard. Farm Rescue secured donated equipment and provided a small team of volunteers to help the Shucks plant over 1,000 acres of spring wheat. Levi Wielenga, left, visits with brothers Lincoln and Loren Shuck. Farm Rescue stepped in to plant their spring wheat crop, allowing them to focus on other spring projects. Farm Rescue volunteer and board member Jeff Larson drives the tractor and air seeder around one of the fields of Lincoln and Loren Shuck near Fairpoint. 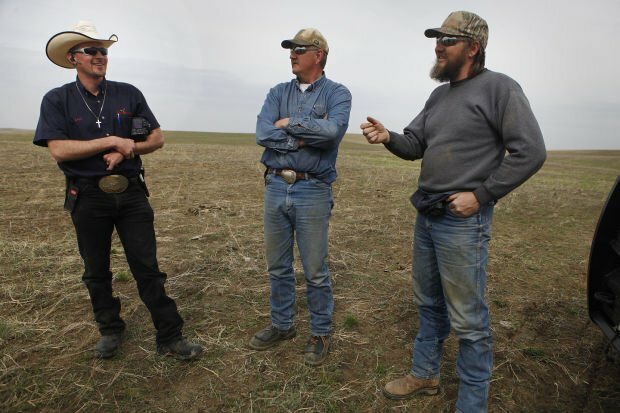 Larson said spring is normally a busy time for farming and ranch families, but it's especially hard for those hit hard by the October blizzard. Power lines along the road to the Shucks' Meade County wheat fields await replacement, months after the October storm. Keith Larson, uncle of Farm Rescue volunteer and board member Jeff Larson, watches the air seeder. Keith, who came out for the day from Spearfish to watch his nephew volunteer, lost about 700 sheep during a storm in the late 1960s in Ekalaka, Mont. Working in shifts, an airline pilot, railroad conductor and a retired farmer planted more than 1,000 acres of spring wheat this week, restoring a little optimism for brothers Lincoln and Loren Shuck of Fairpoint. 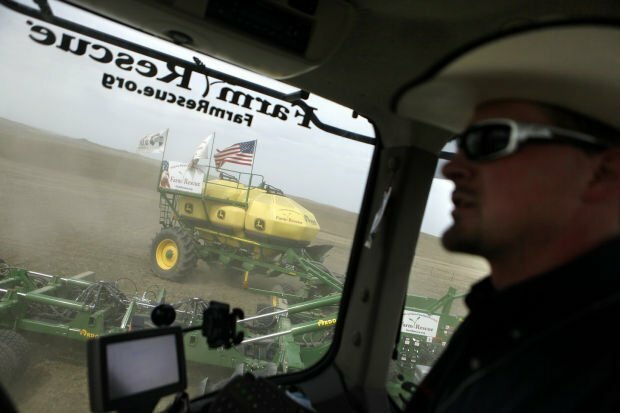 "We planted non-stop and slept in shifts," said Faron Wahl, a regional coordinator for North Dakota-based Farm Rescue. Wahl also took his turn behind the wheel of the powerful John Deere 9560 pulling a drill and air cart through the Shucks' central Meade County fields. It's been a trying time for Lincoln, 50; Loren, 44; and their cousin Cody Shuck, 34. The third generation ranchers lost over 600 cows, calves and bulls, 75 percent of their herd, when October's blizzard swept through western South Dakota. "We were sick," Lincoln Shuck said. "We couldn't believe it." In the days following the storm, Lincoln Shuck aggravated a back injury while the men dug out and scoured the range on snowmobiles searching for surviving cattle or fed neighbors' stranded stock. They went without power for more than a week. In the storm's wake, the men abandoned their plans for a fall planting of winter wheat. Lincoln Shuck's back injury still limits his ability to help on the ranch, where there's always plenty of work to do. They even considered not planting a spring crop. Enter Farm Rescue and Wahl's team of volunteers. The men pulled in late Monday afternoon and started putting spring wheat seed in the ground that night. The John Deere equipment, on loan through R.D.O. Equipment of Fargo, N.D., never slowed down, Wahl said. The Shucks provided the seed, fertilizer and fuel for the planting marathon. "We're really grateful for their time," Loren Shuck said. "This is a big help ... If they weren't here, we'd be behind." His brother marveled that strangers could be so caring and giving. Farm Rescue brought the equipment and manpower to do the job. The volunteers paid for their own trips out here. Farm Rescue arranged a place to sleep and a per diem for meals. For eight years, that's been the process that has helped 252 farming families in North Dakota, South Dakota, eastern Montana, Minnesota and Iowa bridge the gap when an injury or illness strikes, Wahl explains. For farming and ranching families, a sudden illness or injury usually brings the normal routine to a screeching halt, Wahl explained. With fewer folks on the land and operations getting larger, not as many neighbors or family members are around to help when a crisis hits, he said. Farm Rescue offers a one-time solution for a family with an immediate crisis. It's not a long-term fix. Volunteers arrive with planting, haying or harvest equipment to fill the need and then move on to the next chore. Whether it's a planted field, hay cut and baled or grain in the bin, a farm family has one less thing to worry about, Wahl said. "For all of us that work in any capacity with Farm Rescue, it's gratifying and very humbling," Wahl said. Levi Wielenga, a railroad conductor from Sioux City, Iowa, has volunteered with Farm Rescue for four years. He trains new volunteers on the John Deere equipment. "I love to serve God, serve others and farm," Wielenga said. "This is my calling. I get to do all three. It's never about the money. I just get to be out here and farm." Frontier Airlines pilot Jeff Larson is based at Minneapolis, but he grew up in Harding County. He serves on Farm Rescue's board of directors. "When farmers can't help each other, Farm Rescue is there to fill the gap," Larson said, surveying the wheat planting in progress on Tuesday. "There's more work here than what three people can do when they are already busy with catching up from all the damage and loss from the storm." After finishing up at the Shucks' early Thursday morning, the equipment was loaded and ready to move on to the next job. Wahl was headed for Salem, where another farmer needed help. If anyone knows of someone struggling to get their spring work done because of a major illness, injury or natural disaster, Farm Rescue might be able to help, Wahl said. Farm Rescue's efforts are funded through generous corporate sponsors, private donations and grants. For more information or to apply for help contact Farm Rescue at farmrescue.org or call 701-252-2017.